Irina Gonzalez, a 2006 member of Blue Knights, sent this picture. 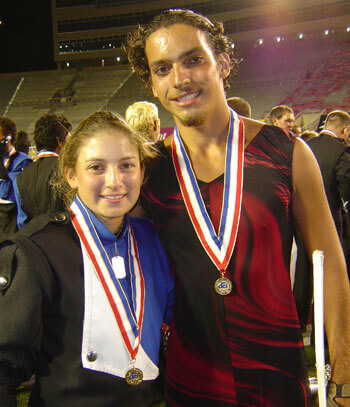 This picture was taken on Finals night at the 2006 DCI World Championships in Madison, Wis. My brother (Andres) and I finished our first year as drum corps members with the Blue Knights, but for me it would be the last. Being an ageout was tough, but I wouldn't have had it any other way. It was the most amazing experience in my life, and if I had the opportunity, I would do it again. My only regret is that I didn't audition earlier in life. Piano is my major instrument and as a music major, I play clarinet in the concert ensembles. I picked up the mellophone in September and auditioned in December, so if you think you can't do it ... think again! My brother plays saxophone and auditioned for a color guard spot with as much practice as I had on mellophone. As the audition dates grow near and you're having doubts, go for it! You have nothing to lose and everything to gain. Nothing is impossible.